Coming back home from vacation is bittersweet. I’m always so happy to be home but so sad to leave, especially when we’re at the beach. 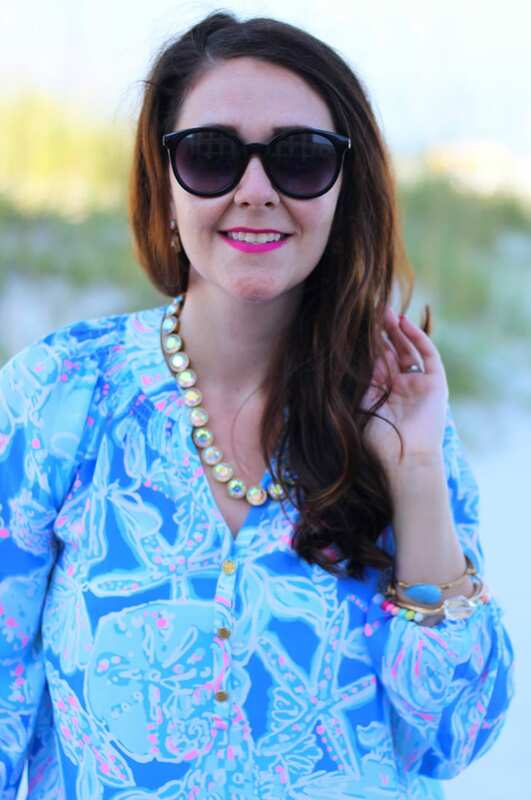 I wore this look out to dinner at Frenchy’s Rockaway Grill while we were in Clearwater, but I didn’t get to take any pictures that night. 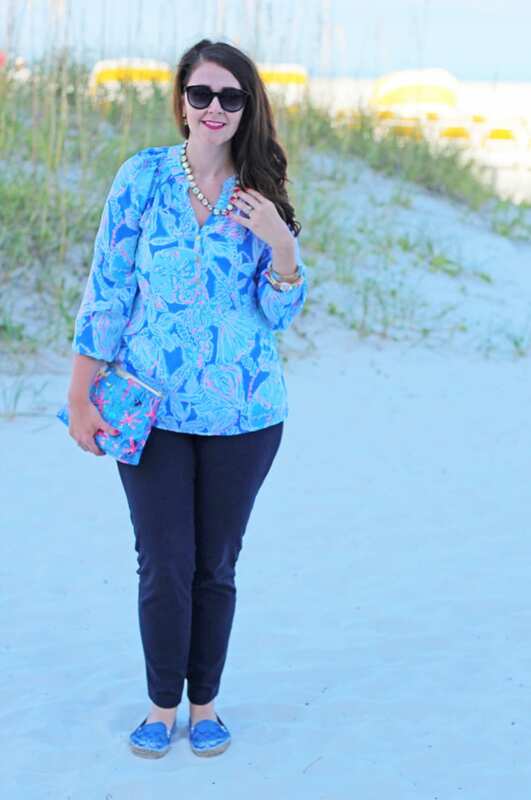 So I snapped these the next morning, on the very first day of fall, before we left the Sandpearl Resort to come home (oh, the blogger life) because this outfit was too cute not to share. Being at the beach was an interesting way to spend the last day of summer and bring in the first day of fall. 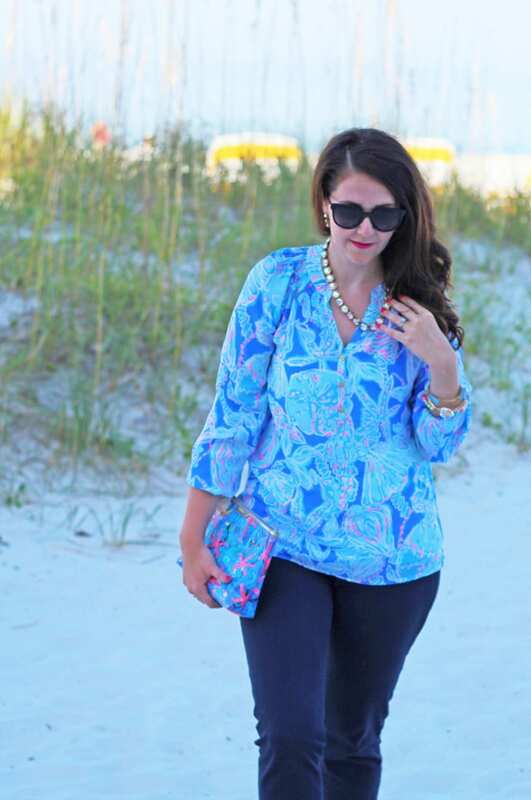 The Lilly Pulitzer Elsa top is a great top to help you transition to fall. While the sleeves are long, they can be pulled up to 3/4 length on hotter days, then let back down to long sleeves for cooler nights. 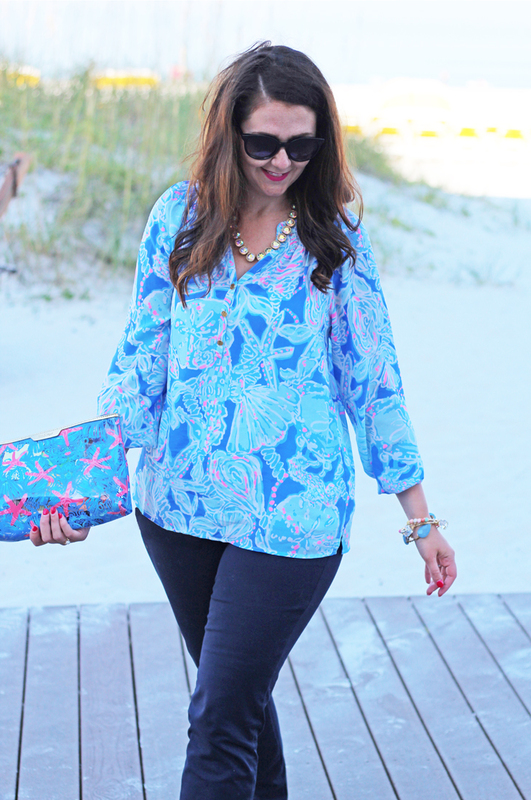 Since the tops tend to be bright, I like to pair them with darker bottoms for cooler weather. 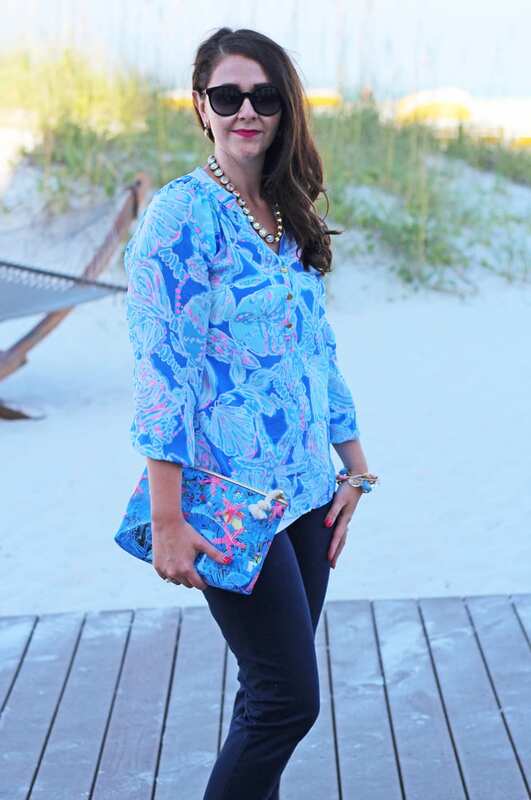 The print I’m wearing is Bay Blue Into the Deep, which I picked up during the After Party Sale last month. 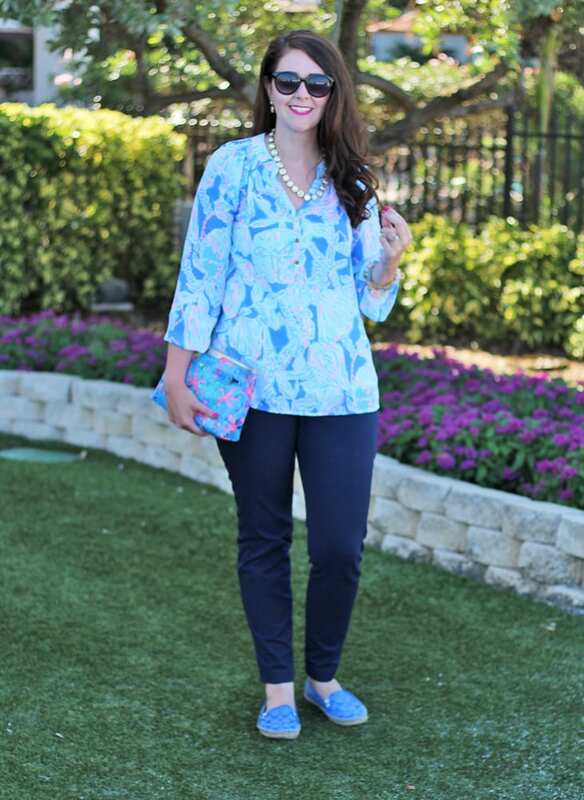 Here, I paired my Elsa top with a pair of navy pants from Old Navy. 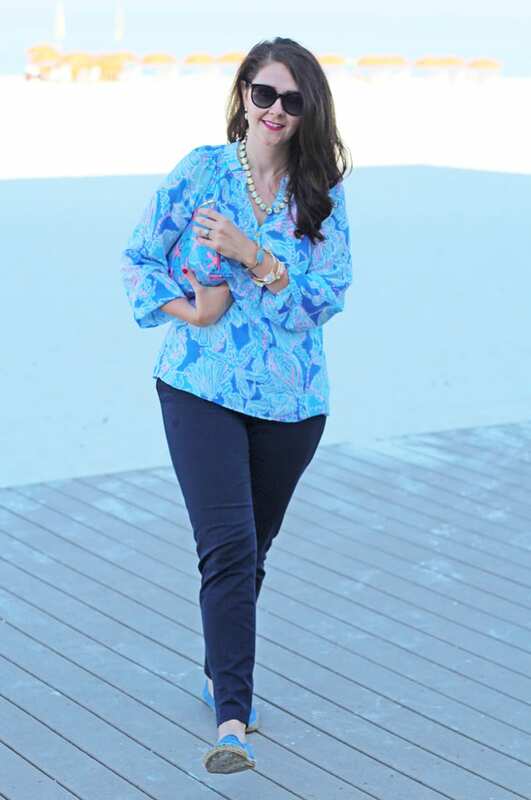 Navy pants are a must-have for your fall wardrobe this year–they’re a perfect fall neutral. And Old Navy’s Pixie Pants are probably my all-time favorite dress pant. 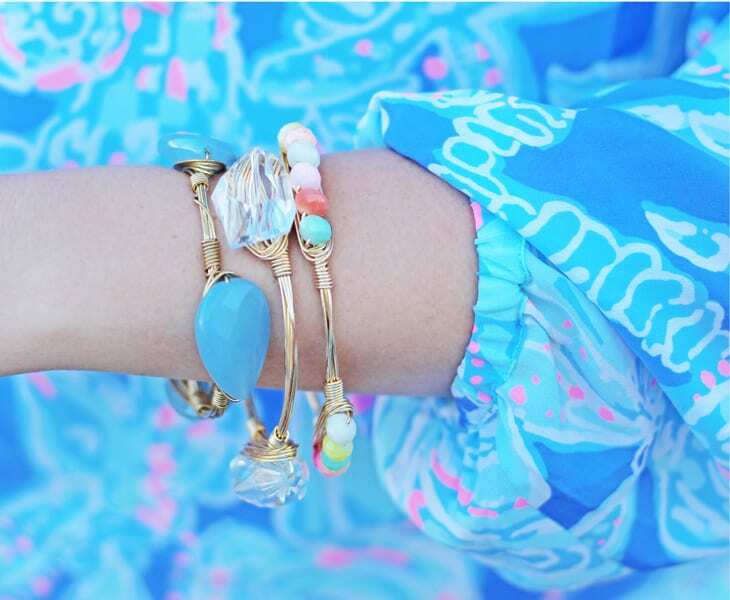 I love that they come in a variety of different colors. I prefer the regular material to the chino material, however, and it’s perfect for fall. The Pixie Pants I have on are actually the long version of the pants. If you’d like to take the ankle pants into fall and winter and they actually fall at or above your ankle, I suggest ordering a long in them to get the same length. Or if the regular ankle pants fit you perfectly, order a short in these. To finish my outfit, I slipped on some lighter-colored shoes to pull it all together. Slip-on sneakers look so cute with pants! 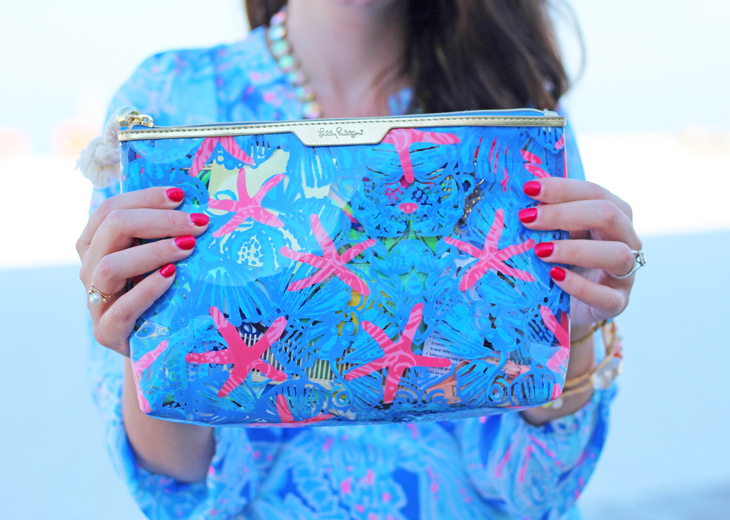 And since we were at the beach, I threw all my things into my clear Lilly Pulitzer pouch that came straight out of my beach bag. How have you said goodbye to summer? 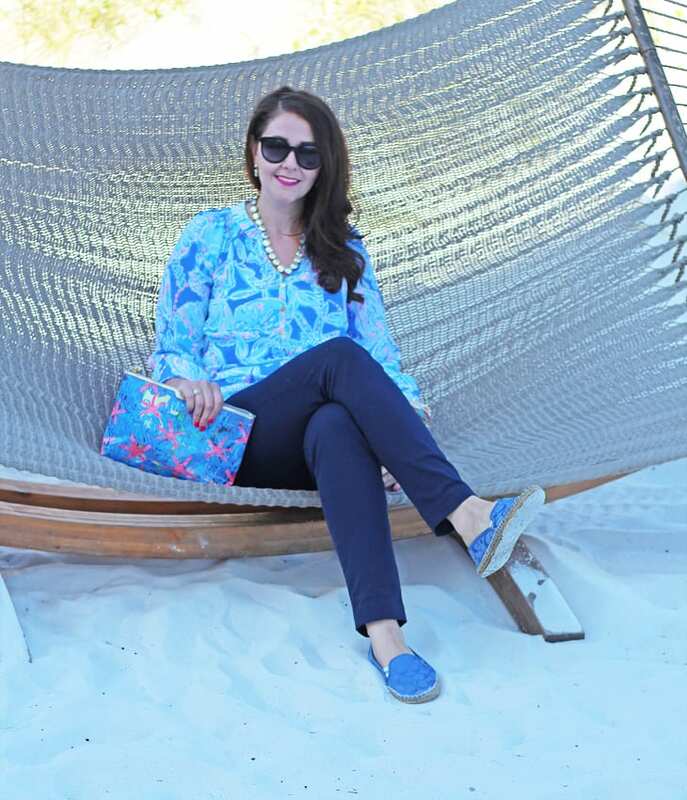 You can take a peek into our Florida vacation here.